For a mall as big as Senayan City Jakarta, it is a rare sighting where people have to wait in long line to have food. Not until St. Marc Café’s Chococros came. Those who have visited St. Marc Café in Japan, Philippines, and Singapore have must tried the famous Chococro. Made by accidentally unfermented regular dough of chocolate croissant, a crew of St. Marc Café at Shibuya-Inokashira Street found the new texture of chocolate croissant which becomes the famous Chococro pastry. It is not as fluffy and crispy as the regular croissant, yet dense in texture and taste richer. First time opened at Ginza Marronie Shop Tokyo in 1989, Saint Marc Group has developed rapidly and operated in almost 400 outlets in Japan, Philippines, Singapore, Thailand, and now, Indonesia. Brought to Indonesia by PT Marinata Boga Jaya, St. Marc Café emphasized their fresh bakery products especially Chococro, pastry with Ghana and Ecuador dark chocolate filling and crunchy peanut sprinkles. 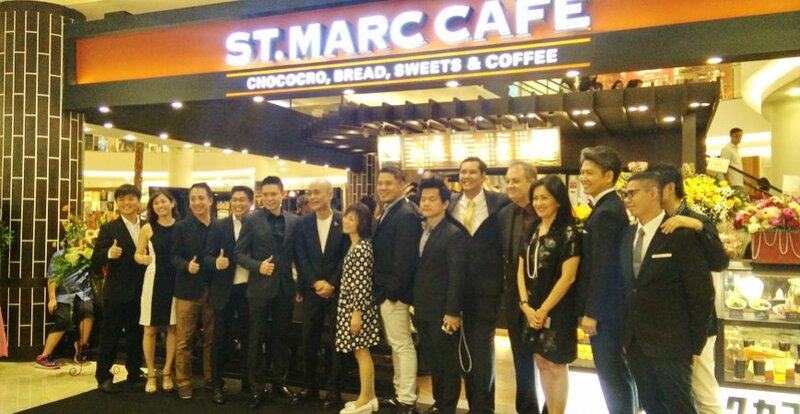 St. Marc Café outlet is opened in one of premium malls in Jakarta, Senayan City to attract mostly middle-high class consumers. “We are very happy to open our first outlet in Indonesia, especially in Jakarta. St. Marc Café’s products are very favoured in Japan, Philippines, and Thailand. Thus, we want to bring the experience of enjoying St. Marc Café’s products in Indonesia,” said President Director of PT Marinata Boga Jaya Monthany Bahterazar. Despite originated from Japan, St. Marc Café provides European pastry, fresh desserts, and various beverages. The trademark of Japan is presented on its ingredients and their looks. For the example, take a look at their two most favourite desserts, Kyoto Delight and Mango Fantasy. Their colourful and tempting looks are the signature of Asian desserts. They are also made with Asian and especially Japanese ingredients. “Kyoto Delight consists of vanilla sponge cake, cornflake, vanilla soft serve ice cream, matcha ice cream, warabi mochi or soy powder-coated mocha, shiratama or usual Japanese mocha, and red bean paste. Meanwhile, Mango Fantasy consists of vanilla sponge cake, cornflakes, vanilla soft serve ice cream, mango, mango puree, and vanilla custard pudding,” said Gisella Cendera, Store Manager of St. Marc Café Senayan City Jakarta. Not only pastry, St. Marc Café also provides various beverages. One of their signatures is Almond Latte Coffee, the blend of espresso, steamed milk, and caramel syrup. The sweetness of this beverage makes a good pairing for slightly bitter Choco Cro. Matcha latte becomes St. Marc Café’s favourite beverage as well. Consists of matcha and milk, this beverage has bitter and full-bodied taste of matcha yet the delicateness of milk complement the whole taste of this beverage. “We know that many Indonesians fancy matcha beverage. This is why St. Marc Café only uses the best cooking grade matcha for our products. It tastes even better when paired with savoury pastry,” said Gisella. With capacity of 43 persons on 80 m2 area, St. Marc Café showcases their open kitchen to make sure that every customer knows that every single pastry is hand made. Bahterazar explained that St. Marc Café gives franchising opportunities as well. PT Marinata Boga Jaya will provide complete training of technical skills and operational standards for employee candidates. “The most important things St. Marc Café’s franchisor must have are positivity and optimism to develop this business. Besides, they have to be passionate in what they do, especially when it comes to gourmet bakery business,” said Monthany Bahterazaar.